Luka Doncic vs. Trae Young: Who's the NBA Rookie of the Year? Luka Doncic vs. Trae Young: Who’s the NBA Rookie of the Year? For much of the season, it looked like Luka Doncic, the No. 3 pick of the Atlanta Hawks who was then traded to the Dallas Mavericks, would be the year’s top rookie. Trae Young went to Atlanta in that trade. And while the Hawks were initially ripped for making the deal, Young’s play down the stretch has made the trade look a lot better. It’s also made the NBA Rookie of the Year race a lot more interesting. Given that the end of the season is in sight, we now wonder who the NBA Rookie of the Year should be. Will it be Doncic, or Young? The Case for Doncic: In more areas than not, Doncic has been the superior statistical player. Doncic has rather significant per game edges in points (21.0 to 18.7), rebounds (7.6 to 3.6), and steals (1.1 to 0.8). He also holds an edge in shooting percentage (42.6 percent to 41.7 percent), true shooting percentage (54.4 percent to 53.9 percent). Doncic has been more efficient, holding an edge in PER (19.4 to 16.3). The Case for Young: While Doncic generally holds better stats, Young does hold some edges. 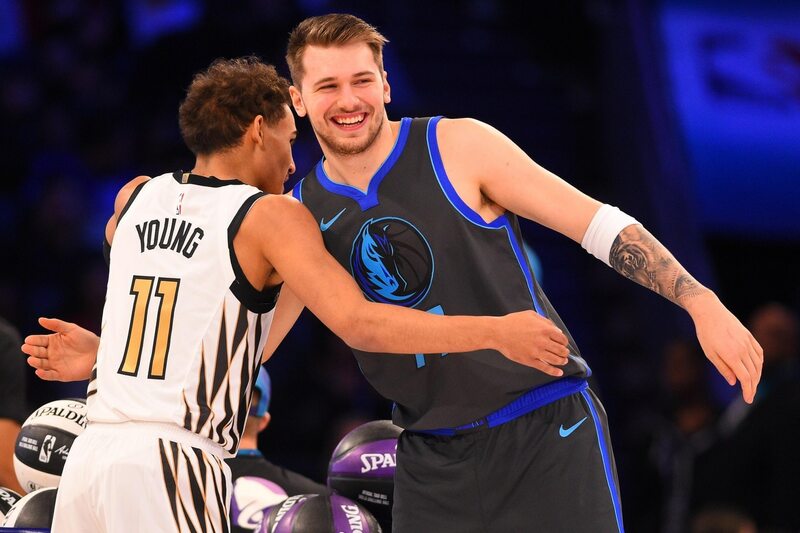 While Doncic’s passing has been raved about, Young has more assists per game (7.9 to 5.8). In a sport like basketball, getting the most out of your teammates is nothing to sneeze at. Young also holds an edge in three-point shooting (33.6 percent to 33.3 percent) and free throw percentage (82.1-70.5). Since the All-Star break, Young has averaged 25.3 points, 4.6 rebounds, 8.8 assists, 0.6 steals, and shot 45 percent from the field, 40.7 percent on threes, and 87.1 percent on free throws. Doncic, meanwhile, has averaged 22.4 points, 9.2 rebound, 6.6 assists, and shot 41.1 percent from the field, 27.6 percent on threes, and 64.8 percent from the line. That’s a pretty significant boost for Young over Doncic in terms of recent production. The verdict: Young has closed the gap. But the edge still belongs to Doncic. Young’s assist edge would hold a lot more weight if his team was better. Granted, we’re not blaming Young for the Hawks being awful (Doncic’s Mavs aren’t exactly lighting the world on fire, either), but Young making his teammates better isn’t translating to wins and losses. So here, individual stats get weighed heavier. Young’s free throw shooting edge isn’t as significant as it seems. While makes free throws at a better percentage, Doncic makes more per game (4.7 to 4.1). The great percentage doesn’t mean as much if you’re not getting to the line. The post All-Star Break edge does favor Young. But we must remember two things. One, it’s a much smaller sample size. Two, Dallas traded some of Doncic’s better teammates in the Kristaps Porzingis trade. That may prove to be a steal long term for the Mavs. But this year alone, it’s hurt Doncic’s production. Porzingis has been sidelined all year with a torn ACL. Young has been a tremendous player. He’s deserved the high praise he’s gotten and has given the Hawks and their fans reasons to be genuinely excited. But as good as he’s been, Doncic should still be holding the Rookie of the Year Trophy at season’s end.